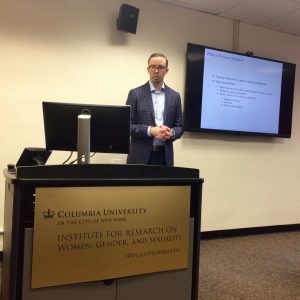 The second Fall 2017 talk of the CSSD working group Precision Medicine: Ethics, Politics, and Culture (PMEPC) featured Dr. Kristopher Hult. In his presentation, “The Economics of Precision Medicine and Disparities in Health,” Dr. Hult shared his research and outlook on the potential of personalized medicine to increase the health impact of existing treatments, and thereby improve patient outcomes. Dr. Hult used multiple sclerosis (MS), a progressive autoimmune neurological disorder, to highlight how personalized medicine may be able to improve clinical care. Existing therapies for MS differ considerably regarding their efficacy and risk of side effects between patients, making accurate assessment of patients’ individual responses highly valuable. For example, Tysabri, a leading immunosuppressive drug, can lead to progressive multifocal encephalopathy (PML), a debilitating neurodegenerative illness; however, the risk varies over 10-fold across patients. Through using genetic information and other molecular biomarkers, such effective medications can be targeted to patients who have the lowest risk, helping balance treatment efficacy and risk. Dr. Hult also presented a case for the potential of incremental innovations on existing FDA approved molecules or therapy. He discussed a quantitative model to assess the effects of policy interventions on innovations and how existing policy to incentivize orphan diseases can differentially affect incremental innovation with respect to novel innovation. While such policies have spearheaded the creation of new therapies, they can also lead to corporate exclusivity, increasing the market price and reducing subsequent innovation. In addition, the promise of exclusivity may further encourage corporate entities to utilize precision medicine approaches to find novel biomarkers, so that they can show that their agent is effective for a narrower segment of the population and thereby market it as an “orphan drug.” The long-term implications of such approaches on pharmaceutical innovation and patient care are unclear at present. Ultimately, evaluating the effects of novel vs. incremental innovation requires comprehensive understanding of the factors that determine health outcomes, such as the impact of a drug on the length and quality of life, cost of the drug, and accessibility of the drug and insurance. However, as Dr. Hult acknowledged, the medical actionability of a disease is ever-shifting, making it difficult to accurately estimate these values. The potential of personalized and precision medicine extends beyond the population who are already sick. It also has the promise to identify healthy individuals at risk, and prevent disease through targeted therapy, with “precision prevention” practiced on a broader scale. However, doing so involves significant financial considerations, and as healthcare spending continues to rise, there is a need to accurately measure the cost efficacy of the interventions proposed. As health systems across the globe shift to policies that prioritize value as well as volume, such considerations are of prime importance. As Dr. Hult noted, personalized medicine promises to revolutionize the production and targeting of pharmacotherapy, and his talk provided a valuable economic perspective on how to evaluate its impact on healthcare innovation and outcomes.